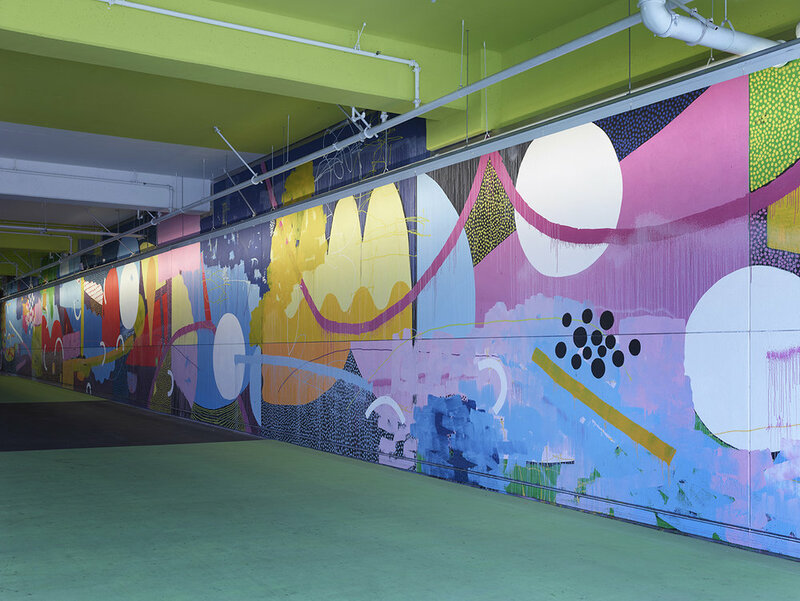 Internationally recognized contemporary public artist and award-winning painter Alex Brewer, known as HENSE, has been creating colorful works of art combining techniques of street art and abstract painting for nearly two decades. Brewer’s artworks incorporate line, shape, and gesture to creative abstract compositions that are invigorated by the quick pace and commentary of street culture. His works in the realm of public arts, grants, commissions, and cross-media connections have landed him local, national, and international public art projects and commissions. Brewer has received numerous notable commissions from the cities of Atlanta and Arizona, and from local big names like Alton Brown and Fay Gold. His largest commissioned work was for The ISIL Institute in Lima, Peru amassing an impressive size of 137 feet tall and 170 feet wide. One of Brewer’s highest honors was a commission by The High Museum of Art in Atlanta to produce a site-specific installation as part of the museum’s summer exhibition Drawing Inside the Perimeter. With nearly two decades of experience, Brewer has been creating artwork since a young age. Growing up in an artistic household allowed him to draw inspiration from various elements of his childhood. Starting in the early ‘90s, Brewer discovered his love for creating art in the public space through graffiti. He quickly became consumed with the graffiti culture and gained notoriety for his work under the name HENSE. A mix of formal education, immersion in street art culture, and experience in professional studios have lead Brewer to establish his whimsical abstract-inspired style. Brewer has always been inspired by creative expression in the public realm and feels it plays an important role in the community. His artwork combines a street culture point-of-view with abstract compositions often consisting of vibrant colors, playful lines and a wide variety of shapes. His work focuses on the relationships of shapes, forms and colors and how those elements interact with one another. Many of his tools remain consistent with those used by graffiti artists, such as rollers, spray paints and house paints. Brewer pushes himself to explore new concepts during the course of creating artwork. The freedom to re-paint and add layers during the progress of a project leaves room for experimentation and discovery. Brewer continues to explore new avenues of his artwork and looks forward to wherever his next projects will take him.